If you want, you could make your grain bill slightly more complicated. You could, for example, swap a small amount of Vienna or Munich malt for a portion of the Pilsner malt. Likewise, you could add a small amount of wheat, perhaps up to 10% to the grist. However, for an authentic tasting tripel, you always want Pilsner malt to dominate the grain bill. Do not add any specialty malts that add sweetness or body to beer, including crystal malts or Cara[anything]. And obviously, for a beer that is supposed to be pale to golden, don’t add any specialty grains that add any significant amount of color. Melanoidin or aromatic malt could be used to bring out the malt character (without adding much sweetness), but keep the amounts low. I wouldn’t exceed 4.0 oz. (110 g) in a 5.0-gallon (19-L) batch. Realistically, Pilsner malt is all you need. Tripel recipes don’t benefit from adding a bit of this and a bit of that. Choose high-quality Pilsner malt, or a blend of high-quality Pilsner malts, and your grain bill will contain everything it needs. Use plain table sugar (sucrose). Yes, some older recipes called for “fancier” types of sugar such as rock “candi sugar.” But, there’s no benefit to these alternate forms of sugar. Just use table sugar. That’s what Belgian breweries use. Noble hops are traditional in a tripel. However, as there is relatively little hop aroma in a tripel, almost any “neutral” hop variety will work well. Noble hops are lower in alpha acids than many modern bittering hops. One possibility, to cut down on the amount of hops used, would be to use a neutral high-alpha hop for bittering, and a tiny amount — around 0.25 ounce (7 g) per 5.0 gallons (19 L) — of noble hops late in the boil for flavor and aroma. Then again, you can never go wrong with the traditional single addition of noble hops, either. The tiny amount of tannins from a large hop addition may even benefit a tripel. Any “Belgian” yeast strain that yields a bit of phenolic “spiciness” will work. Most work well in high-gravity worts and are highly attenuative, which is also required. 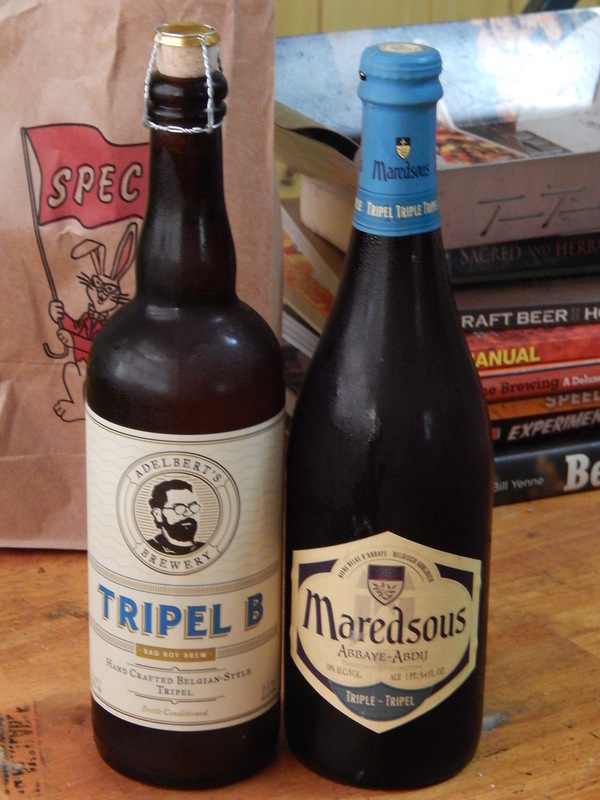 Wyeast 3787 (Trappist High Gravity) and White Labs WLP530 (Abbey Ale) are my favorite choices, and reputedly originated as the Westmalle strain. Wyeast 1214 (Belgian Ale) and White Labs WLP500 (Trappist Ale) are reputedly derived from Chimay’s strain, and they are also good candidates. Likewise, Wyeast 1388 (Belgian Strong Ale) and White Labs WLP (Belgian Golden Ale) are reputedly descended from Duvel Moortgat, brewers of Duvel (a Belgian strong golden ale, in the BJCP’s categorization, but very similar to a tripel). The recipe for a tripel is simple. The key to brewing a great tripel is to use high-quality ingredients, and pay close attention to all the details on brew day and beyond. The next installment in this series will deal with wort production.